Photograph collection of webmaster 25289 at Manchester Victoria, date unknown. The eighteen year career of D7639/25289 started with fifteen months at Sheffield area depots followed by almost seventeen years at LMR depots apart from a very brief spell at Haymarket. Built: Beyer Peacock Gorton Ltd, Works No.8039. July 1967 to Springs Branch (8F), then to the Liverpool Division (D08) following introduction of the LMR Division allocations. March 1972 to London Division (Western Lines) (D01). 25289 was the 210th Class 25 withdrawn, one of five retired during January 1984. 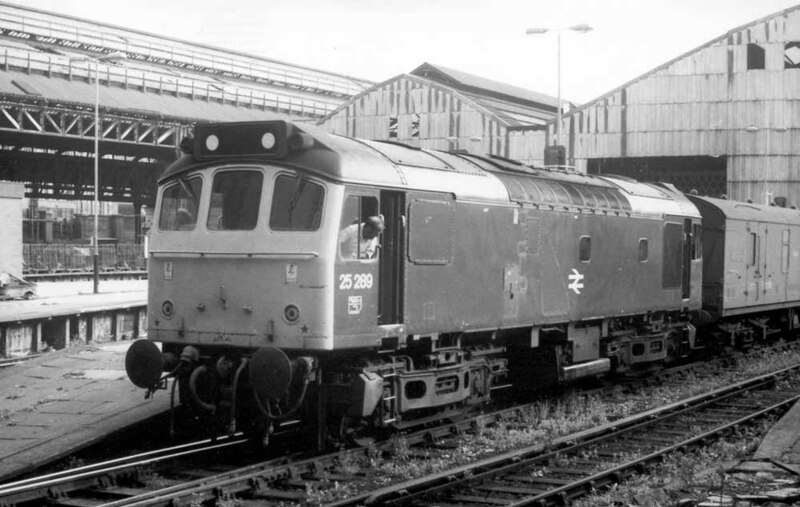 25289 was withdrawn after a shunting accident at Preston station on January 14th 1984. The No.1 end cab suffered minor damage to the lower half of the cab front. In days gone by this would have been very repairable, but it was the deathknell for 25289. 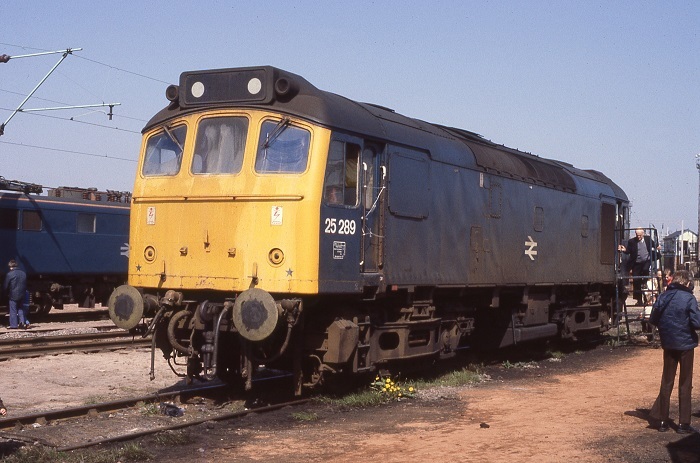 After withdrawal 25289 was moved to Toton until February 8th 1984 when it was moved to Bescot. By March 22nd 1984 it had reached Swindon Works and was broken up here by the of October 1984. Noted Derby Works May - July 1976 (Classified). Noted Derby Works November & December 1980 (N4 & N1 repairs). On August 11th 1973 a relief Euston - Glasgow Central was worked forward from Crewe to Glasgow Central by 7639 & 7668. Whilst diesel haulage north of Crewe at this time was the order of the day, to get a pair of non-boilered Class 25s, and to go the distance they did must have been quite the day out. 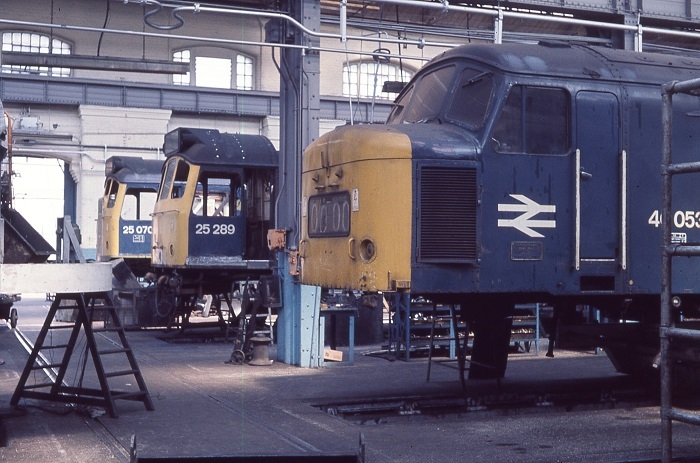 A line-up of locomotives at Derby Works on May 22nd 1976, including 46053, 25070 & 25289. In South Wales the use of Class 25s for working regular freight diagrams was finished, Class 37s now taking up these diagrams out of Cardiff and Newport, though Class 25s would frequently deputise for a non available Class 37. A number of workings brought foreign Type 2s into the area, on November 23rd 25289(HA) arrived with the 22.58 6V88 Warrington - Margam ingot train. With 25289 transferred to Bescot in the summer of 1977 the opportunities for passenger mileage increased considerably. However it was not until the summer season of 1978 that 25289 was able to visit faraway seaside resorts and July 1978 certainly gave 25289 a run for its money. 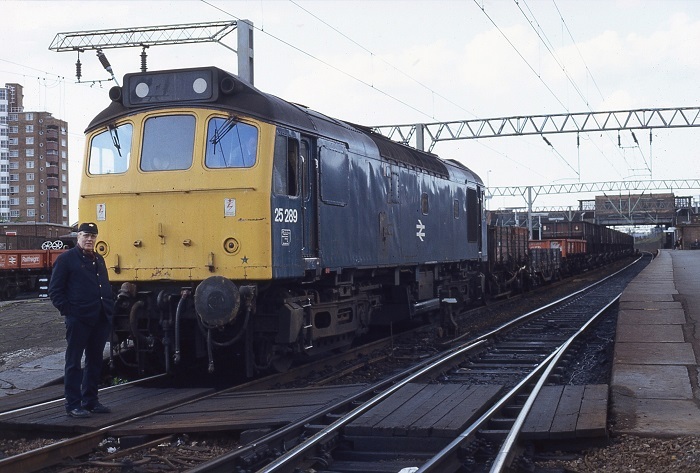 On July 1st 25289 & 25249 worked the 0934 Leicester - Yarmouth relief at least as far as Norwich. A week later (July 8th) 25289 worked the 07.30 Nottingham - Llandudno Town and the 13.02 return, but failed at Cresswell, 25314 took the train forward. The next trip, on July 20th, took 25289 & 25224 to the West Country on a roundtrip Coventry - Barnstaple day excursion, working at least to Exeter. 25289 & 25224 remained together for the next four days, working the 22nd's 08.00 Walsall - Yarmouth to Norwich, coming back with the 14.15 ex-Yarmouth to Derby. The next day the pair worked the 08.40 Leicester - Skegness and 18.30 return. Skegness was the destination on July 24th, but this time the round trip starting from Burton on Trent. August 1978 also proved to be a busy month for 25289. On August 5th & 12th it was working over Cambrian metals with 25271 (5th) and 25282 (12th). A week later on August 19th it was a day out with 25184 on the Walsall - Norwich (for Yarmouth) - Derby service, the next day the same locomotives were working the 09.15 Derby - Skegness and 18.15 return. 1979 brought two round trips over the Cambrian line, on July 14th with 25282 and on September 1st with 25038. May 5th 1980 proved to be bright & sunny day in the Midlands, certainly a blessing for those who had laid on the Nuneaton Open Day. Amongst several locomotives on display was road weary 25289, almost four years after its last Classified repair, and still with several more years of service ahead. 25289 was stabled at Bescot on April 27th. For 1980 the last weekend in July brought a couple of passenger workings. On July 25th 25289 & 25282 worked the return leg of a Scarborough - Leamington Spa day excursion. The next day the same pair made a round trip over Cambrian metals. On July 19th 1981 25289 rescued the 16.12 St. Pancras - Derby, going forward from Leicester when 45127 failed. At the end of August (29th & 30th) 25289 and 25262 worked two round trips over Cambrian metals. On Christmas Day 25289 was stabled at Carnforth Furness Sidings with 25284 & 25080. 25285 & 25289 were noted at Birmingham New Street on August 6th on an unidentified parcels (?) working. 25289 was noted southbound at Carnforth on August 28th with bulk tankers. On November 28th 25289 & 25283 were noted at Leighton Buzzard with a loaded ballast train. Passenger workings started early in 1983 for 25289, on January 2nd it worked the 02.35 Euston - Bletchley, lets hope it was a mild day. On January 17th 25289 was noted at Coventry with a lengthy ballast train. On March 20th 25289 & 25311 worked the 6M86 Kings Cross- Tring cement empties. Two more round trips were worked over the Cambrian line, with 25316 on June 4th and 25327 on July 2nd. 25289 was noted at Stonebridge Park on July 9th. On July 27th 25289 was noted northbound at Springs Branch with bulk powder tanks. Possibly on August 16th 1983 (date uncertain) 25289 & 25044 rescued the 15.12 Preston - Barrow diesel multiple unit at Lancaster, working forward to Barrow and then going forward with a Barrow - Carlisle service. 25289 was stabled at Saltley on December 2nd. 25289 was noted at Bescot on December 23rd. On December 31st 25289 took failed 50025 from Birmingham New Street station to Saltley depot. The last passenger working for 25289 occurred just days before its withdrawal. On January 10th 1984 the 12.50 Leeds - Cardiff failed at Clay Cross behind 45108, 25289 dragged the service to Derby, where 31293 took over, what a travesty. 25289 was withdrawn on January 17th 1984. Photograph collection of webmaster 25289 stands at Duddeston station date unknown. This scene has now changed, the line which 25289 is standing on is now a disused siding, with the track removed south of this point. The yard to the left of the train is closed & lifted although some of the catenary masts that once served the yard still stand. The block of flats on the extreme left still stand. No.1 cabfront: center lamp bracket only, no other fittings: November 1978. Non BIS side: lengthy scrape just below cantrail at center of bodyside: sometime in 1982 until withdrawn. Page added February 16th 2013.